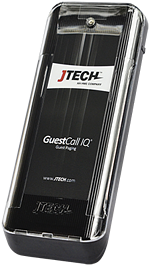 Our GuestCall IQ guest pager is a leap forward in paging technology that improves restaurant efficiency. With the touch of a button, our revolutionary, patent-pending technology will automatically renumber all of your pagers at once. Save time and money as you will forever change the way you program, stock and reorder guest pagers. This sleek digital paddle pager frees customers to wander nearby without worrying about losing their table. While your customers wait, promote your business and services with IQ pager branded inserts. 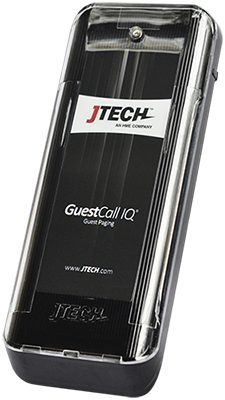 The GuestCall IQ pager features an advertising space the size of a business card. Up to 2 miles of line-of-site coverage with unique ID to prevent signal interference. Built with high-quality materials for maximum durability and industry leading performance. Rechargable to 100% from less than 20% within 4 hours. 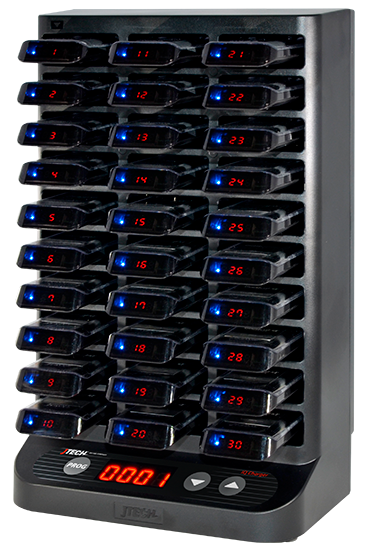 Out-of-Range and Search ensures guest contact and minimizes pager loss. Third-party POS and KDS system integration capability. 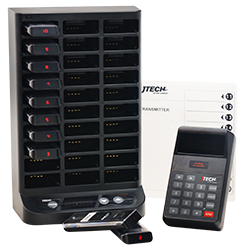 Managers can choose between alpha text, numeric or Rugged rechargeable pagers. Don't forget about alerting your staff.